The following R function provides the basis for downloading the data from a single sheet, given the spreadsheet key and the sheet gid, and puts the data into a dataframe. The query is a query written using the SQL-like Google visualisation API query language. The following routine will download non-empty rows from a specific sheet, and rename the subject specific rank column to a generically titled column (“Subject Rank”). An additional column is added to the table that denotes what subject the table is associated with. We can then add data to this dataframe from all the other sheets, to give us a single data from containing ranking data for all the subjects listed. The result is a single dataframe containing all the subject specific data from the Guardian spreadsheets. If we check the data types of the columns in the full data set, we can see that most of the columns that should be viewed as numeric types as instead being treated as characters. We can also start to quiz the data in a graphical way. 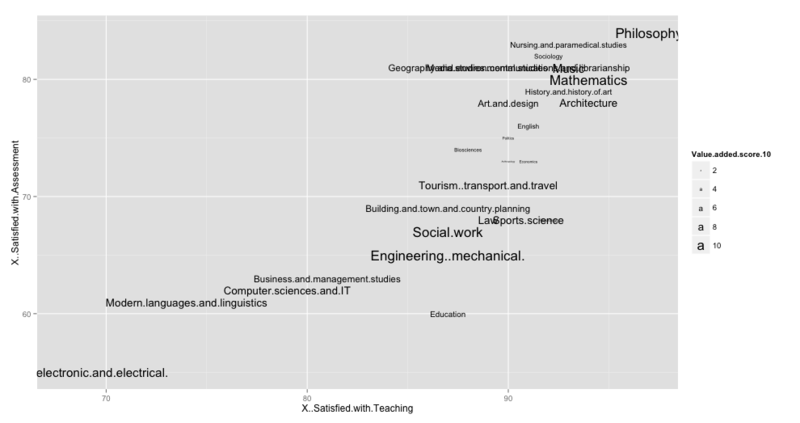 For example, can we get a feel for how courses are distributed within a university according to teaching and satisfaction levels, whilst also paying heed to the value add score? All told, it took maybe a couple of hours of faffing around trying to remember R syntax and cope with https hassles to get this far (including a chunk of time to write this post;-). But now we’re in a position to start hacking out quick queries and having a proper conversation with the data. The work can also be viewed as disposable tool building – it hasn’t required a project proposal, it hasn’t used lots of third party developer time etc etc. Hmmm… maybe I should try to sketch out a quick Shiny app…..?